In honor of the 5-year anniversary of South Carolina’s 2010 baseball National Championship, TRC is briefly recapping each game of the magical postseason run, beginning with their Super Regional-clinching victory over Coastal Carolina. I was actually on vacation in Myrtle Beach on June 13, 2010. It was the second day of my family’s annual trek to the Grand Strand. We had listened to every nerve-wracking second of South Carolina’s 4-3 victory over Coastal Carolina the previous day during our 8-hour drive, and I actually considered going to game two in person. But the combination of 100 degree temperatures and the minor detail that it was sold slap out relegated me to my condo and a seat inches away from a 20-inch television. Coastal was far from a pushover, entering the Super Regional with a 55-9 record and earning the privilege to host the series in scorching-hot Myrtle Beach. Many believed the Chanticleers were the best team in the state in 2010. After being shut down for most of the previous day courtesy of strong pitching performances from Blake Cooper and Matt Price, Coastal broke out the bats in game two and chased now-major-leaguer Sam Dyson after just an inning and a third. The Chants were relentless on offense, hitting three home runs and scoring in six of nine innings. They carried a 9-7 lead into the bottom of the eighth inning, needing only six outs to force a third game in the series. After a Robert Beary leadoff walk in the bottom of the 8th, Whit Merrifield grounded into what appeared to be a back-breaking double play, and the Gamecocks were down to four outs with no one on base. Jackie Bradley, Jr. drew a walk next, and Adrian Morales doubled to deep left to put runners at second and third for Christian Walker. 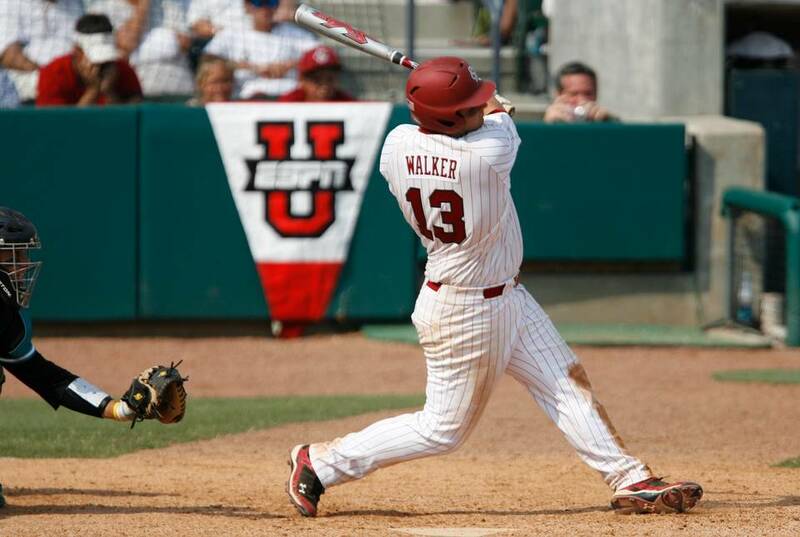 Walker fell behind 1-2, and then proceeded to hit arguably the most important home run in Gamecock history. Matt Price set down Coastal in order in the top of the ninth to send South Carolina to their first College World Series since 2004. As for me, I’ve never enjoyed a game on a 20-inch TV quite as much as that one. And at that time, just getting to the CWS was good enough for me. Little did I, and I suspect we, know what we had in store over the next two weeks. This was awesome. But oh man, the college umpiring is so, so garbage. That second strike to Walker is at least 6″ off the plate.